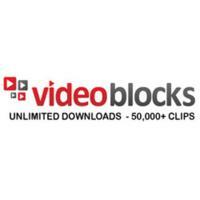 ● VideoBlocks offers a no obligation, 7-day free trial which gives site users a week-long opportunity to download from over 100,000 free stock footage clips and try out the site’s features. ● VideoBlocks occasionally publishes coupon codes offering discounts on membership fees. Would-be subscribers can use these coupons to get savings on monthly or six-month membership programs. ● Subscriptions can be cancelled anytime and subscribers get to keep all downloaded material indefinitely. When a subscription is cancelled, the current billing cycle will be the last to be billed. When you take the time to make a creative project either for a professional purpose or for personal enjoyment there may be a time where you need to find creative content for your project. Video Blocks is an online resource that deals in creative content that is affordable for any type of budget. You can review the different plans and pricing that they have depending on how many videos you need and your budget. There are also more than 800,000 different videos in HD quality, AE templates, and motion backgrounds available for you to purchase and use on your projects. For most up to date offers check out Video Blocks on Facebook and Twitter or contact Video Blocks Support for any questions.